An Englishman in Nijmegen. 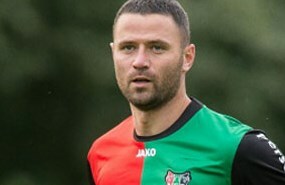 Michael Higdon, striker at the city’s local side NEC, isn’t however the first to live through the experience. Current Bahrain coach Anthony Hudson and former Manchester United man Chris Eagles played at the Goffertstadion before him. Higdon however, chose to join the Eredivisie relegation candidates following an impressive season with Motherwell, netting 26 goals that made him the top scorer in the Scottish top flight and helped the Lanarkshire club finish second in the league behind Celtic. Inside Futbol ran through the key topics with the English striker.